Nem sempre é possível falar de todas as coisas que me despertam a atenção, por isso desta vez vou apenas sugerir uns links que merecem ser partilhados. Desde interactividade numa folha de jornal a fotografias de concertos, a lista de assuntos é variada, em posts escritos em inglês, português e francês. Divirtam-se. It is not always possible to write about all the things that catch my eye, so this time i’ll just suggest some links i believe that must be shared. From interactivity in a newspaper sheet to rock concerts pictures, the subject list is varied, in english, portuguese and french written posts. Have fun. For a few years now people have been talking about semantic search. Any technology that stands a chance to dethrone Google is of great interest to all of us, particularly one that takes advantage of long-awaited and much-hyped semantic technologies. But no matter how much progress has been made, most of us are still underwhelmed by the results. In head-to-head comparisons with Google, the results have not come out much different. What are we doing wrong? Pushing the needle forward means not asking “what have we done in the past,” but instead asking, “what can we do in the future?” How can we innovate? How can we make something better? Pushing the needle forward means realizing that your last project will never be your best project, because you’ll always be trying to make things better. Já toda a gente percebeu que o futuro é móvel. O problema é que este futuro chega cada vez mais cedo e tem agora por hábito nem sequer bater à porta das redacções. Nos EUA, uma tendência ganha peso: os jornais contratam cada vez mais “mojos” (contracção de mobile journalists). (…) Há um diário que está mesmo a pensar em tornar todos os seus repórteres e fotojornalistas “mojos” ainda este ano. Um “mojo” passa a maior parte do tempo no exterior, gravando, filmando, escrevendo. Alguns não chegam sequer a passar pelas suas redacções. Hier, dans thelondonpaper, un des gratuits de Murdoch, un édito écrit par une lectrice. En dessous, le journal appelle les lecteurs à voter par SMS, more or bore ? More et l’éditorialiste amateur continue. Bore et l’on passe au suivant. I have a stack of books on my nightstand just waiting to be read, including Tanner Stranksy’s Find Your Inner Ugly Betty: 25 Career Lessons for Young Professionals Inspired by TV Shows and Not In My Family: AIDS in the African American Community, edited by Gil L. Robertson IV. But not surprisingly most of the books to be read are about journalism and/or new media. Here are the books I plan to read as soon as I find time to crack them open. Who Owns All These Comments? You? Us? Someone Else? Hank Williams relates a story about one of Robert Scoble’s comments on FriendFeed being deleted after the author of the blog post he was commenting one removed his FriendFeed account. While the cynical response might be, “So one of the ten million comments Scoble leaves each day was delete — he’ll live,” it does bring up a valid point about content ownership. The blog owner was upset that his the discussion around his content was taking place outside of his blog, while Scoble was upset that content he created (and thus should own — right?) was removed without his permission. On an increasingly fragmented social web, who owns your comments? Go to a gig today and there’ll be dozens of people shooting photos or video on mobile phones or small point and shoot cameras. I am usually one of these people and have never had any trouble. (…) I was happily enjoying watching these virtuoso musicians play live and taking some snapshots on a small Canon point and shoot camera.So imagine my surprise when one of the ushers came up to me and told me to stop. “There is a strict no cameras policy”, I was told. I was shocked and somewhat taken aback. It is the first time this has happened to me, and I go to see bands all the time. What was more surprising was that many others were doing exactly the same thing, but using cell phones. In a section on accountability, the Trust explores how the BBC’s commitment to “to forge a new relationship with licence fee payers” online and suggests that “recent developments, such as the development of BBC editors and management blogs, mean that the BBC may be able to fulfil this commitment much better in the future”. What is startling is how the audiences for the BBC’s blogs have grown, with the Trust noting that “usage of the blogs now outstrips usage of the BBC’s corporate site and the Have Your Say message boards. In fact, usage of Have your Say message boards has been fairly static between 2006 and 2007″. 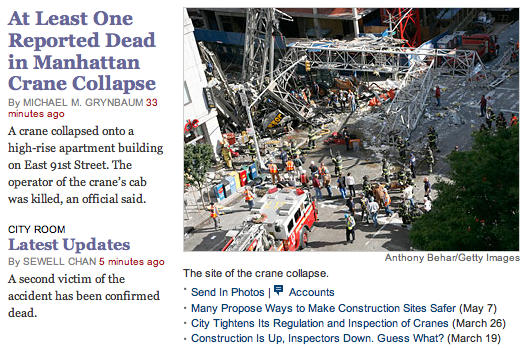 The edited, packaged story says that one person died in yet another crane collapse in New York today. But right below that, the lightning fast Sewell Chan has later, more up-to-date and correct information in his blog — two have died — which the Times wisely feeds directly onto the home page, contradicting their own edited story. In a breaking story, a blog in the hands of a good reporter beats a long line of editors. Richard MacManus do ReadWriteWeb fez uma apresentação para o XMediaLab dedicada às novas tendências que levarão a web do 2 para o 3.0. Dessa apresentação fica este slideshow muito interessante. Podem seguir os links que estão na apresentação. ReadWriteWeb’s Richard MacManus gave a presentation at the XMediaLab dedicated to the new trends that will take web from 2 to 3.0. From that presentation was left this interesting slideshow. You can follow the links in the slideshow. The Halifax Evening Courier will tomorrow launch an online feature enabling it to crowd-source questions for high-profile interviews that have been selected and approved by its readership. The Johnston Press title is the first newspaper in the UK to make use of technology from interactive news site Yoosk that allows readers to submit and vote on questions they want to be put to interview subjects. Eu desde cedo me apercebi que era péssimo a fazer entrevistas. Com o tempo e com dedicação (estudar estudar estudar fazer fazer fazer) consegui melhorar e agora é uma das minhas modalidades favoritas. Mas agora é tudo muito mais simples (ou não): existem novas ferramentas que permitem aos utilizadores – a verdadeira razão de se fazer uma entrevista, embora haja quem pense que são os entrevistados – participarem activamente no processo. O Halifax Evening Courier em colaboração com o Yoosk vai permitir a participação dos seus leitores no questionário a algumas personalidades. Assim, as questões são mais abrangentes e não ficam limitadas a uma agenda estabelecida pelo entrevistador, que pode ter razões ulteriores ou pouco conhecimento sobre algumas matérias (ou seja, de pouca qualidade). As possibilidades para entrevistas em tempo real e com a participação dos utilizadores aumentam com a utilização do Twitter ou do CoverItLive. No Twitter vamos dar como exemplo um programa de rádio, que receberia as questões para o seu convidado em estúdio através desta aplicação, em tempo real, e em 140 caracteres. Mais conciso é complicado. O CoverItLive já permite outra margem de manobra, com respostas escritas pelo convidado a questões que poderão ser mais elaboradas. Ainda tem a vantagem de se poder manter uma sondagem durante a entrevista através da mesma plataforma. Este formato funciona melhor para um jornal, já que a transcrição seria publicada na edição impressa do dia seguinte, condensada para a online, e o original da manter-se-ia no site. E sabem de uma coisa? São de borla. Since early days i realised i was lousy with interviews. With time and dedication (study study study do do do) i managed to improve my skills and now is one of my favorite formats. But now everything is a whole lot easier (or not): there are new tools that allow users – the true reason for making an interview, although some might think it’s the interviewee – participate actively in the process. The Halifax Evening Courier along with Yoosk is opening the questioning of some personalities to their readers. Thus, the range of questions will broaden and won’t be limited to a hidden agenda of the interviewer, due to ulterior motives, or for being short in his knowledge about some issues (which means, a poor quality professional). The possibilities for real time interviews and with user participation increase when we apply Twitter or CoverItLive. With Twitter – for example, in a radio show – we can receive the questions to the guest in the studio through this application, in real time, and in 140 characters. More concise is complicated. CoverItLive offers a different margin for manouevre, with answers written by the guest to more ellaborate questions. It also has the advantage of running a poll during the interview inside this platform. This format works better for newspapers, since the transcript could be printed for the next days issue, condensed for the online edition, and the original could stay up in the website. And do you know what? It’s free. I could be dead wrong in saying that Twitter will never go mainstream but one thing is clear: it has a long way to go before it catches up to “antiquated” communications tools like IM and SMS. Unfortunately, Twitter’s lack of diversity and the fact that there’s little indication that it’s gaining much traction of note outside of the circle jerk that is the technology/blogosphere/Web 2.0 community does not bode well for Twitter’s mainstream prospects anytime soon. For now, Twitter will have to be satisfied with $15 million in funding and the knowledge that it’s like a virtual version of The Biggest Loser, except for the fact that the twats who win don’t lose weight – they lose time that is probably better spent elsewhere. You should really be trying to get fired. Ok, don’t seriously try and get fired like throw-an-M80-in-the-bosses-coffee-mug fired. But do speak out with passion, vigor and conviction to any and everyone, regardless of rank, when you see your company doing stupid things in the dying, old media way. Your company probably needs you more than you need them. You can either speak out now and try to save both your butts, or sit back, fall in line and wait for them to cut your job to save theirs. Se estão a acabar os vossos cursos de Jornalismo posso vos dizer que ainda agora estão a começar. Will Sullivan do Journerdism deixou muitos bons conselhos para quem está vossa situação (e não só). Deixo mais um: acreditem em vocês mesmos, e sejam bons uns para os outros. Isto é uma profissão que podemos adorar, mas é apenas trabalho. E boa sorte. If you just graduated in Journalism i can tell you this is just the beginning. Will Sullivan from Journerdism left a lot of good advices for those in that situation (and others can take them too). One more from myself: believe in yourselves and be good to each other. This may be the job we can love, but it’s only work. And good luck. Foi há um ano que escrevi o meu primeiro post no Lago. Como em qualquer aniversário, acho que é altura de fazer um balanço e explicar algumas coisas a quem me tem seguido. Cliquem aqui para continuar a ler. Há uma pandilha porreira que se junta de vez em quando e deixa uns posts nos blogs uns dos outros, sob um tema designado. Desta vez calhou a Ryan Sholin receber a festa dedicada a “Que devem parar de fazer as organizações noticiosas hoje,imediatamente, para terem mais tempo para a inovação?”. A minha sugestão é pararem de serem tótós. Ideias mais elaboradas podem ser encontradas aqui. There is this great gang that gangs up once in a while and leaves some posts in each other’s blogs, under a designated theme. This time it’s Ryan Sholin’s turn to host this carnival dedicated to “What should news organizations stop doing, today, immediately, to make more time for innovation?”. My two cents are: stop being so dumb. More ellaborate ideas can be found here.